When water is leaking, you have the problem of wasting costly water, but you also have the issue of possible damage to your property or your home. Water leaks aren't always easy to locate, so you'll want a pro to find the source and fix the situation as quickly as possible. 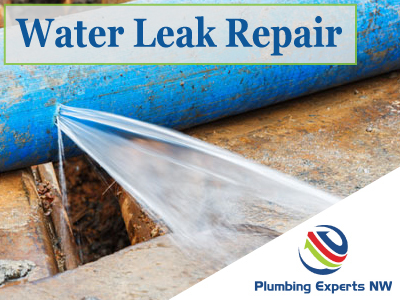 Plumbing Experts NW deals with the pipe leaks and general water leaks Lynnwood homeowners may run into, and we do it fast, getting a plumber to your home and working to find and fix your leak whether it's in the ground or in your home's walls. You may run across a spot on the wall, water pooling somewhere, or even pooling in the yard when no rain has occurred. You'll usually want to turn off your water source. This makes getting a plumber on site quickly a high-priority. Plumbing Experts wants to be the professionals that come quick and begin diagnosing the problem right away. Issues can vary and can be a small as a loose fitting or leaky section of pipe or an unexpected crack underground, other times it could be larger issues. You may find you have a need for home repiping due to old/corroded pipes or need for a better underground water line material. In any case, getting to work right away will help you save your water bill, stop damage, and get you your convenient running water again. We're a full-on Lynnwood Plumber, and we'll take on anything plumbing-related for you and your family! Water leaks aren't just surprising, they can be costly. Get our professionals on site to get it stopped quickly, and repaired right. Sewer Line Camera Inspections are the only real way to know if your sewer clogs are caused by a sewer line break. Many don't realize plumbers like us do water heater repair & replacement. Call us if your hot water isn't working right. Lynnwood residents know that Plumbing Experts clears any drain clog, and we do it quickly. Call 24/7 for excellent service. For sewer repair in Lynnwood or possibly just sewer cleaning, call us. We have all the professional tools and experience.